On Sunday, ALPA, along with millions of people in this country, took time to honor the nearly 3,000 lives lost on September 11, 2001. An important facet of ALPA’s “never forget, never again” focus is to advance the security of aviation operations as part of the 9/11 legacy. In the aftermath of the attacks, Congress mandated that reinforced flight deck doors be installed on passenger airliners. Unfortunately, practical experience using these doors soon revealed a critical vulnerability—the reinforced door must be periodically opened during flight for pilots’ operational and physiological needs, which means that they may be compromised by one or more intruders who could rush the flight deck.To address this unintended security loophole, another layer of safety, the “secondary barrier,” was developed by airlines for use whenever the cockpit door is open during flight. 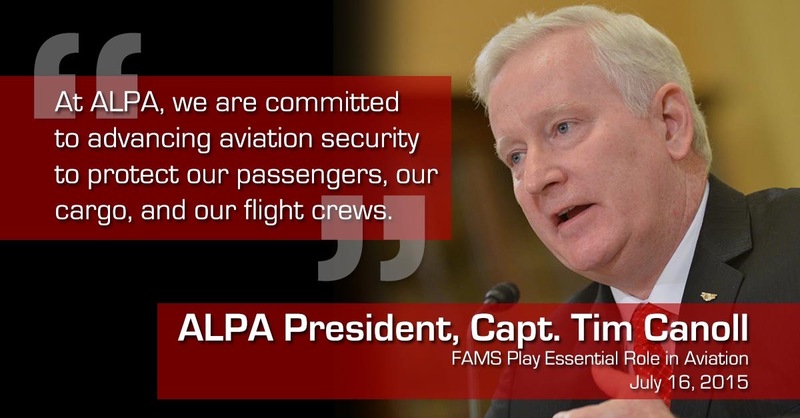 In order to enhance security for passengers, pilots and the national defense, ALPA continues to be a leader in efforts to enact legislation that would require secondary barriers on all passenger aircraft. ALPA pilots this week continued to encourage their elected officials to vote for secondary cockpit barrier language in the upcoming FAA reauthorization legislation. Through an ALPA-wide Call to Action, pilots reached out directly to Capitol Hill on the importance of these proven, effective, and efficient layers of security for the cockpit. In a post earlier this year, Capt. Jerry Timmerman highlighted the merits of secondary cockpit barriers. These lightweight devices, installed between the passenger cabin and the cockpit door, are easy to deploy and stow. They successfully and efficiently block access to the flight deck whenever the reinforced door is opened in flight. 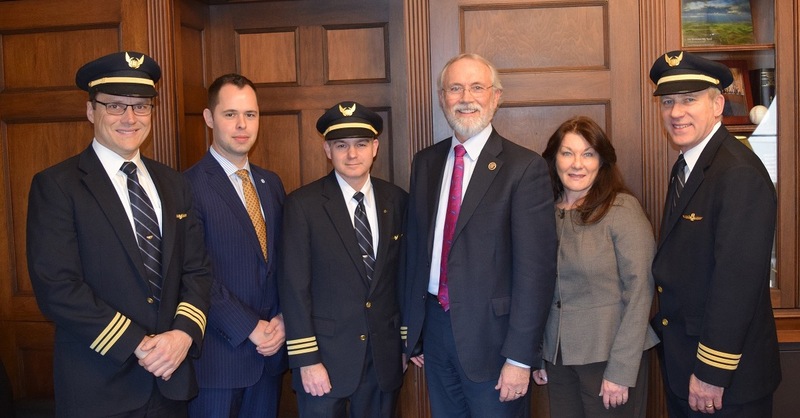 This week, United Airlines pilots took to Capitol Hill as part of ALPA’s efforts to mandate secondary barriers on passenger aircraft. 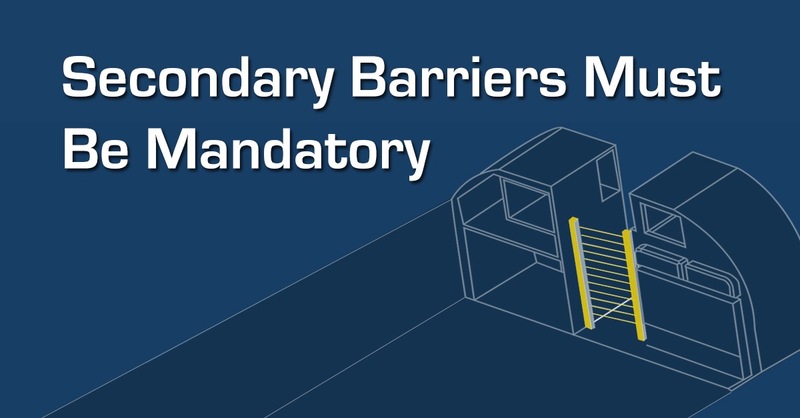 Secondary barriers are lightweight devices that are easy to deploy and stow, installed between the passenger cabin and the cockpit door, that block access to the flight deck whenever the reinforced door is opened in flight. After the attacks of 9/11, the U.S. Congress and the Canadian Parliament mandated that airlines replace standard cockpit doors with hardened doors on certain types of airliners. However, practical experience using these doors soon revealed a critical vulnerability—the reinforced door must be periodically opened during flight for pilots’ operational and physiological needs, which means they may be compromised by one or more terrorists who could rush the flight deck. To address this unintended security lapse, a secondary barrier was developed by airlines for use whenever the cockpit door is open during flight. Government and industry studies have shown that secondary cockpit barriers are an effective, inexpensive way to protect our aircraft during flight when the cockpit door must be opened. The current alternative—a flight attendant acting as a human shield with or without a serving cart—is not an acceptable layer of security. On July 16, I testified before members of the U.S. House Subcommittee on Transportation Security about our union’s support for the Federal Air Marshal Service (FAMS) as a key element in a multi-layered, risk-based approach to aviation security that also includes advancing the Federal Flight Deck Officer (FFDO) program and installing secondary cockpit barriers on passenger airliners.